Tibetan Soul Star Reiki; Ancient Traditional Healing System From Tibet? Is This Authentic Reiki From Tibet? "Tibetan Soul Star Reiki is an energy system for Reiki Masters which will teach you symbols that help activate, clear and align the Higher Chakras (7 Chakras) and connect one to their Divine Higher Self and are designed to assist in the ascension process. 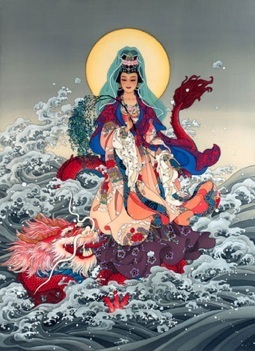 This is Kwan Yin, the Chinese female embodiment of Chenrezig, the deity of compassion. Apparently these symbols have been channeled by Joni Brestler and her 'Ascended Tibetan spirit guides' with the assistance of Kwan Yin. There are three powerful major symbols and two minor symbols. Every one of these sites offered to sell the attunements long distance for a mere $29.95 up to $149.99! Of course you also receive a manual or a "complete guide to natural healing". On one of the sites you could also get a 'Spirit summoning star' for only $27 or have a spell cast! Another site said that someone named Arthur Robertson brought Tibetan Symbols into the picture and that there were 18 of them. The one I like best is that it comes from the "Ancient Reiki Mystery School of Tibet"! I could not find an example of any of these mysterious symbols. I thought that perhaps if they looked slightly like Tibetan script, words or the Sanskrit language then maybe there was a chance that they did originate from an ancient Tibetan shaman or monk.